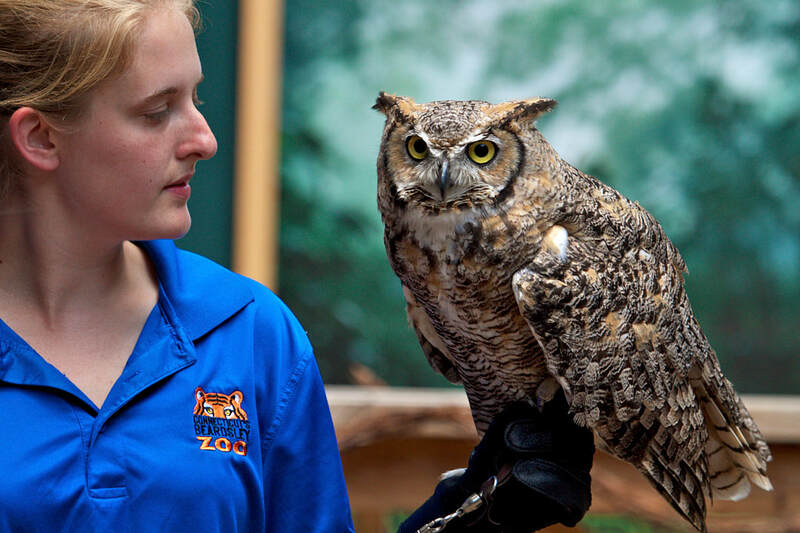 Very large owls up to 25 inches in length with wing spans up to five feet in width. These are the largest North American “eared” owls (sporting feather tufts on the head). They are typically brownish owls with blackish streaks and spots. They possess a whitish throat patch and paler under-parts. Owls from open habitats tend to be lighter in plumage while owls from forested habitats tend to be darker. Found in all habitats ranging from city parks to mountains and rainforests to deserts. All of North, Central and South America (except the West Indies). A partial list includes: shrews, rabbits, hares, squirrels, chipmunks, mice, rats, muskrats, mink, weasels, skunks, pocket gophers, woodchucks, opossums, raccoons, foxes, snakes, feral cats, bats, ducks, geese, pheasants, swans, other owls, hawks, falcons, song birds, crows, frogs, fish (including catfish and eels), crayfish, insects, scorpions and porcupines! After a 26-30 day incubation period, 2-3 eggs are laid in January to February. The young are fledged (grow adult flight feathers) by June. The young, like the parents, are aggressive and fiercely solitary from their nest days onward. Owls, like all raptors, are fully protected by U.S. law. Though we may not see them often due to their nocturnal nature, Great Horned owls are quite common throughout their enormous range of the entire western hemisphere.